A fast, incredibly compact portable SSD, but a bit too expensive to be practical for everyday file transfers. The first time I picked up the T1 SSD at Samsung’s booth at CES 2015 in January, I thought it was empty. A plastic shell, just a prototype housing for what would eventually be a portable SSD. 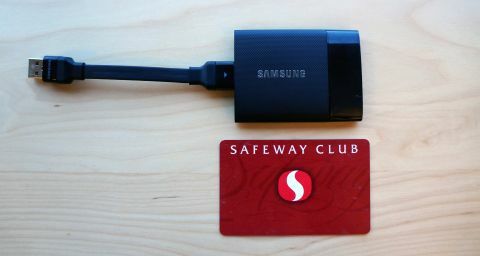 But it wasn’t empty: it was full of the same TLC V-NAND memory Samsung uses for its full-size 850 EVO, our favorite SSD. Full of a whole terabyte of memory, in fact, in a credit-card sized housing that weighs only 30 grams (1.06 ounces). Balancing the T1 in my hand was one of those now-rare moments when a new piece of technology genuinely stunned me. I’ve used plenty of flash drives, some now as big as 256GB or even 512GB, but they’re often heavy and block surrounding USB ports. The T1’s light weight makes it seem almost casual and effortless in holding up to 1TB of data, and I was eager to test one out to see if it matched the performance of the full-size 850 EVO. It doesn’t—not quite—but under ideal conditions, the T1 SSD can hit read/write speeds of over 400 MB/s, better than you’re going to get out of most high-end USB drives. The T1 comes in 250GB, 500GB, and 1TB flavors, each the same size: as wide as a credit card, but slightly shorter and 9.2mm (0.36 inches) thick. Instead of a male USB plug, the T1 comes with a short cable for plugging into USB ports. It feels a bit odd to plug it into the back of your desktop and let it dangle, but the drive is so light there’s no worry about it wiggling loose. When plugged into a laptop, the short, stiff cable keeps the drive from flopping around. I started out benchmarking the T1 with CrystalDiskMark, which offers a pretty good approximation of real-world performance. It scored 427 MB/s on sequential reads and 409 MB/s on sequential writes. That’s fairly close to the 850 EVO’s scores of 510 MB/s and 493 MB/s when I reviewed it. After running CrystalDiskMark, I put the T1 SSD through the same benchmarks we used to test USB flash drives, dumping a 32GB folder of 20 video files onto and off the drive and then a 15GB folder of 10,000 images. With the large files, the T1 SSD managed 352 MB/s reads and 307 MB/s writes. With the small files, it scored a predictably slower (but still good) 220 MB/s read, 227 MB/s write. That write speed is far faster than any of the flash drives we tested, likely thanks to Samsung’s controller and UASP support. Speaking of UASP, you may need a BIOS or driver update to take full advantage of the T1’s speed over USB. Before installing ASUS’s USB software, I was only seeing write speeds of around 80 MB/s. Getting UASP support working made a massive difference in write speeds, making the T1 a great, fast drive for moving around bulk files. The T1’s most impressive performance, for an external drive, is actually in the random numbers it put up in CrystalDiskmark. 4K read/write speeds are much indicative of OS performance than sequential speeds, as they require accessing many many small files scattered randomly across the drive. The T1 managed 153 MB/s random 4KQD=32 read speeds in CrystalDiskMark. For comparison, the full-size 850 EVO had 4KQD=32 read speeds of 390 MB/s, which is far faster. But our favorite all-around USB flash drive, the SanDisk Extreme CZ80, scored a mere 4.6 MB/s. That makes the T1 an almost-ideal drive for a portable pocket Windows installation. It unfortunately lacks TRIM support, but it’s easily fast enough (and holds enough data) to comfortably run an OS. The only thing that makes the T1 tough to recommend as an instant purchase is the price. The 500GB model costs $245 on Amazon, while the 1TB model is $482. The 850 EVO is $180/500GB and $380/1TB, while a fast portable USB drive like the SanDisk Extreme CZ80 is a no-brainer $43/64GB. If you typically only need enough to space to move a handful of photos or videos or game files between computers, the T1 SSD is overkill—a fast flash drive is a far cheaper and more sensible purchase. But if you’re looking for a vastly speedier alternative to a more permanent storage solution like an external HDD, the T1 is a mini marvel of size and speed. Even after using it for a few weeks, it’s still hard to believe there’s 500 gigabytes of data bouncing around inside.